Fabricated Dirt Box with bolted or quick release cover as required. Suitable for liquid application. We also offer design of Fabricated Dirt Box. · Mainly used in front of Bulk Water Flow Flush. · 3 mm hole dia perforations standard. · 3 times Free straining area standard. · MOC : MS Fabricated. · Economical in use . · Vent and Drain provided . · Pressure drop maintained very low. Under the strict supervision of our experienced professionals, we are offering an innovative collection of Dirt Box. This box comes with bolted or quick release cover as required. Suitable for liquid application, our offered range is availed in a variety of sizes, designs and other such specifications to choose from. The offered box is precisely designed at our highly developed manufacturing unit following industry defined guidelines. The offered range can also be availed from us at the industry leading prices. Sizes: 1" to 32" NB. Flanged to 125/ 250 FF and 150/300/600/900/1500/2500 RF, can be drilled to BS tables, DIN and IS standards. Also available with 1" 1.1/2" screwed ends. 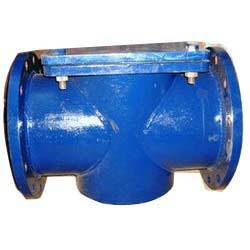 Mainly used in front of Bulk Water Flow Flush. 3 mm hole dia perforations standard. 3 times Free straining area standard. Pressure drop maintained very low.